Debuting for North Hobart as an 18-year-old in late 1960, Trevor Best had before long become one of the brightest young stars in the TANFL competition, featuring in the Demons’ back-to-back TANFL and state premiership triumphs under Peter Marquis and ‘Dasher’ Eaton in 1961-62. A tough but skilful rover/centreman who possessed a fantastic drop kick, exquisite disposal by both hand and foot and excellent hands for his size (175cm), Best’s talents quickly drew interest from across Bass Strait, with Carlton making overtures as early as Best’s first season. After nearly three years, a good deal of wrangling and three separate clearance requests from Best himself the deal was finally done, and Best ran out for the Blues in Round 10, 1963 against Melbourne at Princes Park. Over the next year and a half, Best turned out 21 times for Carlton, starting mostly on the interchange or in a forward pocket. Unfortunately the Blues were in the middle of one of the club’s rare lean periods in terms of success, and as a result Best featured in only eight wins and no finals in his time with the club. 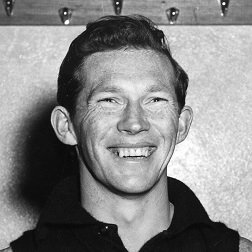 At the end of 1964 Best made the decision to return to Tasmania for the benefit of his young family, and after spending a season as captain-coach of Franklin in the Huon Football Association, he re-joined North Hobart for the 1966 season. Over the following six years Best would cement himself as an important cog in the champion Demons combinations under John Devine. He added two more TANFL flags to his resume (1967 and 1969), a third state premiership (1969), and was a member of the 1967 state final side against Wynyard (the infamous ‘Goalpost Match’). In 1967 he also featured in the only TANFL representative match of his career, the famed five-point defeat by the Huon Football Association. After nine seasons and 179 games, Best departed North Hobart at the end of the 1971 season, spending the remainder of his playing career coaching back in the Huon Association – where he won a premiership with Huonville in 1973 – and in various amateur leagues around Hobart. Best hung up his boots at the end of 1979 and soon afterwards, in 1982, was instrumental in the foundation of Superules football in Tasmania (now known as AFL Masters), a modified rules form of football specifically designed for people over the age of 35 who still have a passion for playing. Best served as an Executive Committee member for eight years, including a time as vice-president, as well as Tasmanian president and delegate for the committee.